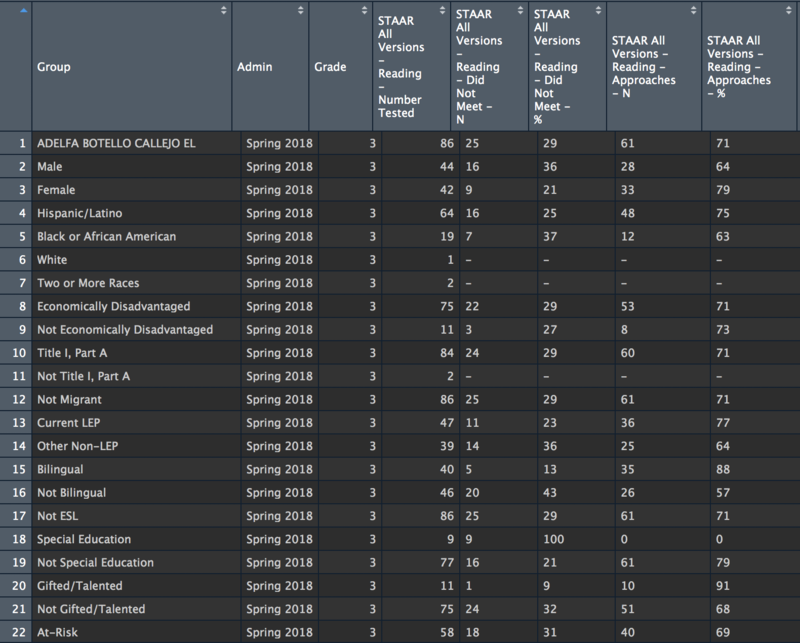 I’ve been working with preliminary student State of Texas Assessments of Academic Readiness (STAAR) data pulled from the Data Interaction portal. The data I’m interested in includes proficiency levels for every subject for every individual school, disaggregated by all available demographic splits. Because downloading all of the data will likely require building a webcrawler, I’ve started this project by working with a small subset of 20 Elementary and Middle Schools in the Dallas Independent School District (DISD) for the 2018 school year. 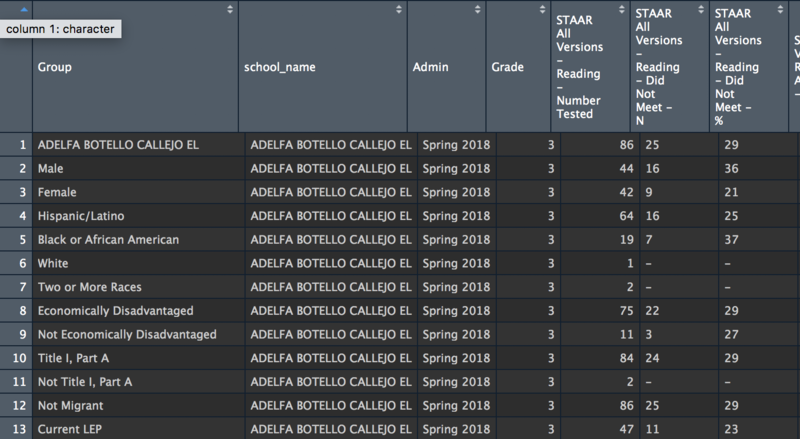 What you’re seeing is a school name, in this case ADELFA BOTELLO CALLEJO EL, followed by 20+ rows of STAAR data split by various demographics for a given grade (we’re seeing the 3rd grade). After all of the demographic information for the third grade, the school will be listed again, followed by additional demographic information for the fourth grade. 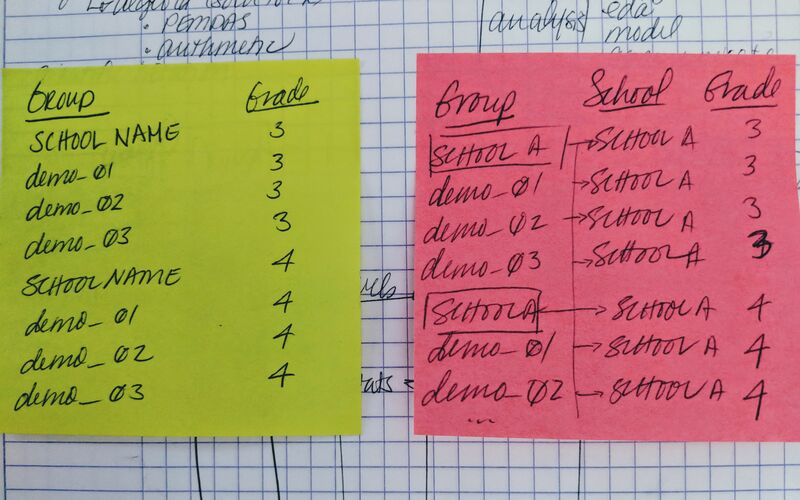 This continues for all grades for a given school before we get data for the next school in our list. Drawing things out is a great exercise in creating a concrete representation of what you’re trying to accomplish by slowing you down in a way that prevents you from spiraling out of control with a bunch of garbage code thrown at your console, while also giving you space to consider the various nuances of what you’re trying to do. In this case I noticed that my school names were always in all caps, and got the sense that I was going to be doing some sort of repeated operation that was going to differentiate between a school name and a demographic. My guess was that I was going to need to use purrr() in some capacity, but nothing quite seemed right. So I asked for help. I hate asking for help for a lot of reasons, but I always encourage others to ask for help. So in an effort to practice practicing what I preach, I spent about 30 minutes on working out a solution, come up with what I thought was an informed guess, and could articulate the problem well enough to ask for a nudge in the right direction. Remember: asking for help after 30 minutes of working on something is infinitely less painful than asking for help after 30 hours of working on something. I’ve set this example up in a GitHub repository, and I want to invite and encourage anyone who is interested in leveling up their GitHub and/or wrangling skills to build out this repo. There’s nothing in here that you can break, destroy, or modify in a way that makes it unusable - in fact I’d encourage you to use this as a low-stakes repo to contribute to! If you’re not sure where to start, consider updating the README, approach this problem a different way, continue tidying up the code, or even do a full-blown analysis! Whatever you choose, I’m happy to support good-faith contributions and help you out as you develop your open source contributing skills. If you’re new to GitHub, check out Jenny Bryan and Jim Hester’s happygitwithr.com.